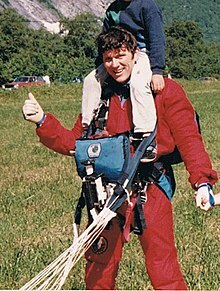 Carl Ronald Boenish (April 3, 1941 – July 7, 1984), considered the father of modern BASE jumping, was an American freefall cinematographer, who in 1978 filmed the first jumps from El Capitan using ram-air parachutes. These jumps were repeated, not as a publicity exercise or as a movie stunt, but as part of the development of a recurring recreational activity. This approach defined modern BASE jumping. These were the jumps that popularized BASE jumping more widely among parachutists, likely because Boenish filmed them and presented the footage exceptionally well. Boenish also published BASE Magazine to promote safety in this new sport. Boenish's cinematography work included the 1969 John Frankenheimer parachuting film classic The Gypsy Moths, starring Burt Lancaster and Gene Hackman, and a National Geographic Explorer segment on jumps from El Capitan. His life and death is the subject of the 2015 documentary film, Sunshine Superman. Boenish was a Christian Scientist and a broken leg that was not properly set hampered his walk. Trolltindene ridge: «Stabben» inside red circle, «Trollspiret» under arrow, «Bruraskaret» in blue rectangle above the cone shaped scree. 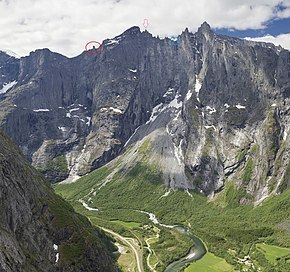 Boenish died in a BASE jump off the Stabben pinnacle in Trolltindane range (not Troll Wall proper) in Rauma, Møre og Romsdal, Norway, the day after completing a successful double BASE jump with his wife, Jean Boenish, for a Guinness World Records television special hosted by David Frost and young Kathie Lee Johnson, now Kathie Lee Gifford. Jean Boenish did another jump two days after the fatal jump. ^ Di Giovanni, Nick. "BASE Jumping History". Archived from the original on 2007-01-28. Retrieved 2007-02-05. ^ "BASE-Jumping Doc Sunshine Superman Plunges You From Cliffs and Skyscrapers". www.villagevoice.com. Retrieved 2018-10-03. ^ "Exhilarating film follows inventor of BASE jumping". New York Post. 2015-05-20. Retrieved 2018-10-03. "Carl Boenish photo". Retrieved 2012-12-18.